Conversations in the workplace happen every day unless you’re in that corner office that no one dares to come to, but how many of your workplace conversations are productive? HR has an open door policy, I sometimes joke that I should get one of those revolving doors to make it easier on everyone. All conversations aren’t healthy in the workplace and sometimes it boils down to the extrovert/introvert talk. Some people were born talkers, they want to have a conversation about everything under the sun. But did you know that you’re not needed in every conversation? I had to tell a coworker this once before, sometimes employees will feel entitled to find out information because they are friendly with the HR crew. They think that working in a small company gives them certain privileges to information … it doesn’t. Now, this isn’t to say that having unproductive conversations, asking people about what’s going on in their life isn’t important, but how much of it is becoming a distraction from getting work done? #Nextchat this week was awesome, another great twitter chat HR Pros should join (@SHRMnextchat) every Wednesday. The topic was about being distracted by technology, but it made me wonder, is technology really the leading cause for distractions? Communication in the workplace comes in all different forms, but being in the same office with someone makes it very easy to go and knock on their door or just come in and start talking. How do you tell someone that this conversation is cutting into your work time? I watched ‘The Office’ over the past month and the number of meetings they had every day was crazy, they couldn’t sell anything because they were always in another meeting that wasn’t productive or was just a party. How much of our employees time are we wasting? 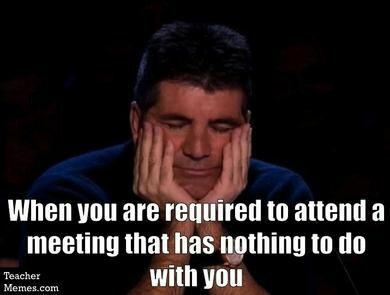 Meetings can be important, but sometimes a full meeting isn’t needed to correct the action of a limited amount of people. HR should be getting out and talking to the employees, finding out what’s happening, if they need help, if there is something causing them stress. These things don’t have to work related, but they could be affecting the work of the employee. HR Newbies, getting out of your office is one of the best lessons you’re going to learn coming into HR. Employees tend to be more afraid of the “HR Office” because of what it represents, go to the employees’ turf to make them feel more comfortable. I challenge you all to sit down and think if that next conversation or meeting you’re about to call is important. Could you use that time for one on one training with a department, could you check on that employee that called out twice this week, could the team use this time to actually work on a project they may be behind on? Conversations are important, yes, but how many of them are necessary? Make sure you check out the Contact page, connect with me on social media or send me an email if you want to read about something specific!